Home › FAQ › What is the Difference Between an Online Application and Paper Application to College? What is the Difference Between an Online Application and Paper Application to College? The difference between an online application and paper application to college is primarily how the application is submitted, processed and then reviewed. Just like most employers would prefer you to submit an electronic application, most colleges prefer the same. In the past, the only way to apply to college would be to fill out a thick paper application and then mail that thick packet into the admissions department where it would be sent to the appropriate desk and sit for weeks. Now, with so many different advanced in technology, it is possible to save on postage and to ensure your application is received by filling it out online. Read on, and find out more about online and paper college applications. If you have access to a computer, you can access an online application by visiting the college’s official website, according to Campus Explorer. Simply conduct a search for the college or review a list of colleges through an informational site so that you can find the landing page. When you are on the landing page, you will be able to find the application for admissions by located the link to the webpage for prospective students. This may be titled different for each college, but will refer to new students. Once you find the online application, you will fill out all of the fields, attach your letters of recommendation, and even submit documents and essays from the same platform. Not only can you fill out the form, you can even go in and forward documents that you are missing later. If you plan on filling out a paper application because you do not have regular access to the Internet, then you may need to go to the library to download the PDF to be printed. You can even download the file and type your answers to each field so that the application is more neat and tidy. Some colleges will send you a paper application by mail if you call in and request it. Once the paper application is completed, you will need to physically attach postage and then mail it in for review. Additional documents that need to be sent in separately may take time to be processed so it is important to review deadlines closely. The college application is what any admissions professional will use to decide if you are a good fit for the school. Typos, misspelling and other other errors can really reflect on your poorly. Since this is such an important document that will help decide the path you take in the future, you need to sit down and focus as you are filling out your form. Be sure that you have your transcripts, GPA, SAT test scores, activities, and community involvement information readily available. After you have everything the typical application askes for, you can then create an account online with the college to access the form. Fill out the fields, attach scanned images and documents, and then submit. Be sure to jot down the confirmation number for your records. 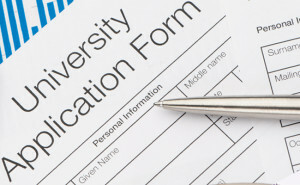 Many schools are now becoming member schools that accept the Common Application. This is a uniform online application that will help students apply to multiple schools at once. Be sure that you understand the different between an online application and paper application to college, and then use the one that is best suited for your situation.